At The Beauty Rooms we use Advanced IPL technology – Intense Pulsed Light – for the permanent reduction of hair, removal of thread veins and improvement in acne and pigmentation. Our therapists are trained and experienced in the use of this technology. To download more information on the science behind this revolutionary treatment click here. A course of treatment is required usually between 6 & 12 treatments to gain desired results. Unwanted hair growth is caused by many different factors and so an in depth consultation & patch test is required prior to treatment. At this consultation our friendly therapists will discuss treatment planning and try to answer all the questions before you commence a course of treatment. Below is a price per session and treatment area guide but this is not a definitive list and details are discussed at consultation. 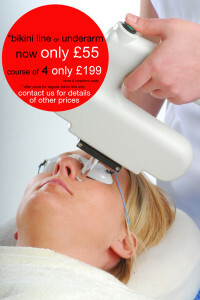 Please ask for details of current offers on courses of treatment. For other areas and prices call 01924 291547 or email customerservice@mintsalons.co.uk * offer prices are subject to periodic changes. Pigmentation marks such a “age spots” can be caused by various factors including sun exposure and hormones. Theses can be easily and effectively removed from the face & body using IPL. Not all pigmentation is suitable for treatment. We also offer Electrolysis for hair removal in situations where Laser & IPL is unsuitable or contra-indicated . This is a tried and tested method but needs a course of regular treatment to be effective.